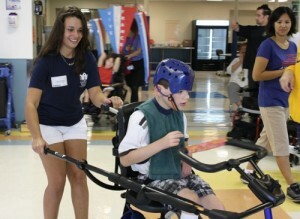 Centenary student Chelsea Qualliu of Westwood, NJ, pushes Matheny student Scott Gordon in a wheelchair race. 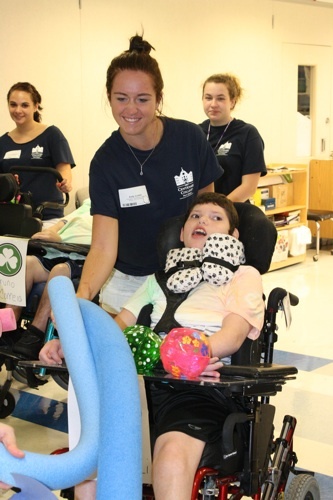 Every fall, incoming freshmen at Centenary College in Hackettstown, NJ, participate in Community Plunge, a mandatory community service requirement in which students volunteer at a variety of community organizations. Matheny is fortunate to be on Centenary’s list every year, and on Monday, August 27, several students from the liberal arts college participated in a variety of Olympics-style events that included wheelchair races and obstacle courses. Josh Ecochard, Centenary’s coordinator of community service, told The Star-Ledger that the students visiting Matheny found the day unexpectedly moving. “It’s very emotional,” he said. The college believes the event offers its students “a unique opportunity to focus on a particular area of the community by providing them with the choice of several different locations to volunteer at for the day.” In 1990, Centenary became the first college in New Jersey to introduce community service as a required part of its curriculum. Centenary student Kelly Conklin of Monroe, NJ, maneuvers Matheny student Michael Taurozzi’s wheelchair through an obstacle course. This entry was posted in Uncategorized and tagged Centenary College. Bookmark the permalink.